Download the WhiteStar Legal Mapper Add-In for ArcGIS Pro. Exit ArcGIS Pro if it’s running. Click Install Add-In on the confirmation dialog box. Use your WhiteStar Cloud account credentials. Select geometry type (WellSpotter for points or LeaseBuilder for polygons). Enter a Legal Land Description in the Legal Land Description edit box. Multiple Legal Land Descriptions may be entered. Unique user identification can be entered into the Id box. Your legal land descriptions could come from anywhere, a database or a spreadsheet. However in this example we use notepad to build a simple CSV file named legals.csv. The first line contains the identifying attribute names id and legal. Id is a unique identifier for each legal description used to merge in other data in later steps if so desired. In the field, these IDs (lease numbers, etc) are often alphanumeric, but we will use a simple positive integer. 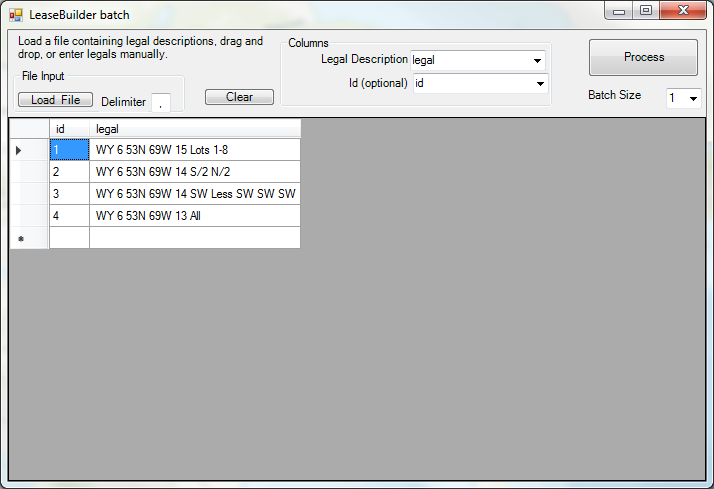 Click ‘Load File’ button or drag and drop legals.csv into the LeaseBuilder batch form. Under Columns Set the Legal Description column to ‘legal’ and the Id (optional) column to ‘id’.